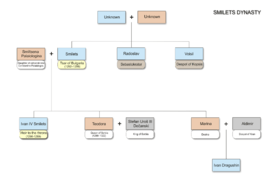 Smilets dynasty was an imperial house of Bulgaria. It is one of the smallest royal houses. It was founded by Tsar Smilets of Bulgaria. ↑ Pavlov, Plamen (2006). Търновските царици [Queens of Tarnovo]. Veliko Tarnovo: ДАР-РХ. ↑ Pachymeres Vol. II, Andronicus Palæologus, Liber V, 18, str. 406, and Liber VI, 35, str. 559.